[LucidMovement] was looking for some crystal-based artwork and just couldn’t seem to find anything that fit the bill, so he decided to build something himself. 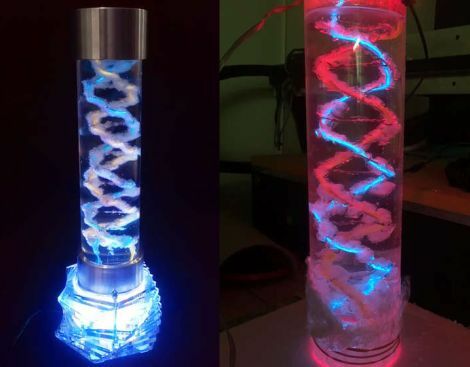 The inspiration for his desk lamp came from something we’re all familiar with, a DNA double-helix. To grow the crystals he built a helix-shaped growing substrate out of nichrome and EL wires, submerging them in a warm alum solution. Once he had a nice set of crystals, he mounted it in an acrylic tube, filling the air space with clear silicone to seal off the display. He then mounted the silicone-filled tube on top of a rotating acrylic stand that he had cut for the project. The stand is made from several sheets of acrylic and contains both the gearing for movement as well as RGB LEDs to light the display from the bottom. The lamp looks great when sitting idle, but when he powers it on it really shines (no pun intended). [LucidMovement] put a ton of work into the lamp, and offers up all sorts of tips, tricks, and considerations for anyone looking to build their own. Be sure to check out his writeup for plenty more details, and stick around to see a short video of the lamp in action. Helix 2.0 has been released. Helix is a collection of various tools for electronic forensics. Just like on TV, you can use this to find all kinds of information on a computer. Some of the useful tools added were Winlockpwn a tool for breaking windows security, Volitility which processes data out of the raw memory, and several other tools that are beyond our comprehension. You’ve undoubtedly noticed that the title says Helix V2.0, but the image and header of the Helix site say 3. We have no idea why. Look at the download info to see that it says V2.0.